We know that Jaws and The Meg aren’t really comparable as films, but we went ahead and did it anyway. We thought that it might be fun to see how these shark Goliaths stacked up alongside one another, cinematically. Jaws is the original summer blockbuster and was the first film to pass the (then) magic $100 million mark. So how does new shark on the cinematic block, The Meg, fair in comparison? Jaws: originally planned to cost $4 million, beset with weather and (ahem) ‘shark acting’ problems the final budget swelled to a reported $8-9 million. 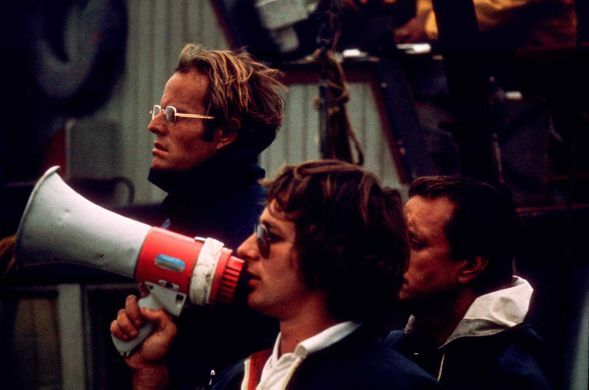 Jaws: Originally planned to be just a 55 day shoot, the schedule ballooned to 159 days. The Meg: Shooting took place from October 13 - January 11, which is around 90 days. Jaws: An adjusted $33,077,019.43 for #Jaws ($7,061,513.00 in 1975). The Meg: Confounding all expectation, The Meg grossed $44,500,000.00 - adding a further $91 million internationally - which included over $50 million from China, one of its key markets and a Chinese co-production. Of course The Meg opened on far more screens - 4,118 against not even 500 for Jaws. Yep, we know ticket prices are a lot more today, we have adjusted for inflation as well. Jaws: In 1975 terms Jaws grossed $260 million, adjusted for inflation that is a mighty $1,173, 202.00. Still not a bad cinematic record for this vicinity - not to mention seventh on the adjusted box office takings chart. The Meg: Yes, we know it has only just opened. Only time will tell if The Meg has enough power in its huge tail to keep momentum and make a swim for it as the highest grossing shark film of all time. With such an impressive opening it should at the very least secure itself a sequel. Like all good shark sequels though, we demand a devoured helicopter. It was also nominated for Best Picture. Amazingly none of the leads were nominated for Best Actor or Best Supporting Actor. The Meg: 1? Don’t scoff. It’s too early for nominations yet, but who knows The Meg could be up for the Academies new category ‘most popular film’. Just sayin! Jason Statham would probably be the first to admit that he won’t be up for an acting Oscar either.